The conference will highlight experimental research and projects that explore the reciprocity and synergy between bits and atoms, the digital and the physical, and between digital code and material logic. The conference will bring together designers, researchers and practitioners who engage, question and aspire to stretch these boundaries. Architects, fabricators, engineers, media artists, technologists, hackers and others in related fields of inquiry are invited to participate. 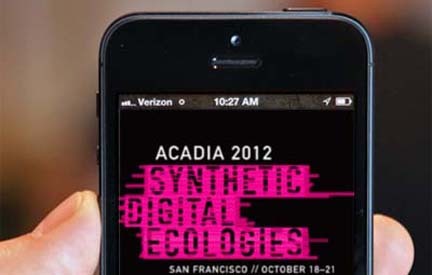 Download the ACADIA 2012 App for the iPhone and for Android phones. San Francisco is the metropolitan center of the Bay Area. Surrounded by water and connected by spectacular bridges, the city is well known for its dramatic hills, diverse neighborhoods, world-class restaurants and its liberal minded tech-savvy citizens. Nearby attractions include Napa Valley, Muir Woods, Berkeley, Silicon Valley and more. For additional visitor information visit here . CCA San Francisco is the hub for design innovation and experimental architecture in the Bay Area. Its downtown campus is located in a 120m long former bus depot and is home to a world-class fabrication and digital design facility adjacent to its design studio spaces.